Polypodium amoenum (charming, pleasing), synonym Polypodiodes amoena, has pinnatifid, large (for a Polypodium) fronds reaching to 2 ft. (60 cm). 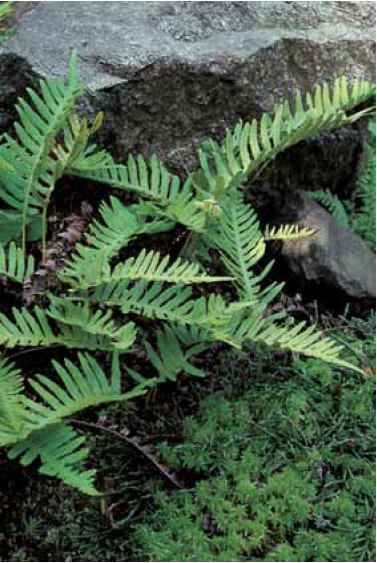 The tips of the pinnae and fronds are sharply pointed with the pinnae swirling upwards toward the frond tips. The foliage is dull but leathery, scaly on the undersides and mildly hairy on the upper. The species is an interesting departure from the North American look-alikes and should have potential in protected Zone 8 sites and settle with ease in Zone 9. It is native to the Himalayas, China, and Taiwan where it grows as an epiphyte or on shaded rocks. Polypodium glycyrrhiza x P. scouleri is very rare in nature and even rarer in cultivation. 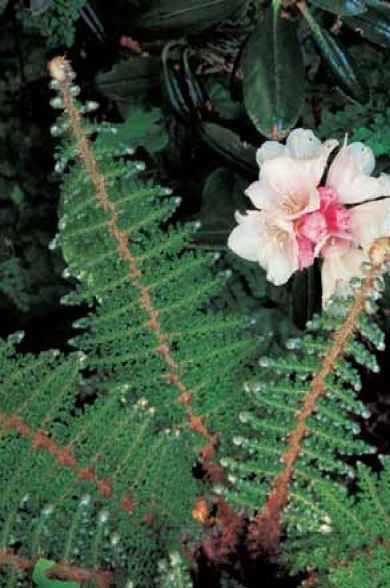 (I, a native of the Pacific Northwest, home of both species, first met it in the gardens of German specialists.) The fronds are a succulent dark green, like the P. scouleri parent, but pointed at the tips, and not summer deciduous like P. glycyrrhiza. Like its parents, it settles willingly into the woodland duff of Zones 7 to 9. Polypodium xmantoniae (after Irene Manton, 1904-1988), a hybrid between P. vulgare and P. interjectum, is found throughout Europe and Britain. 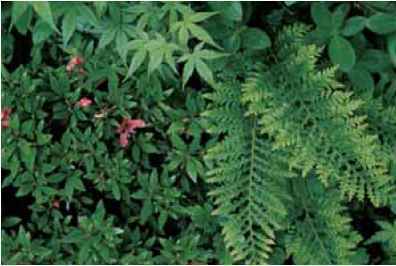 It is easily confused in shape and habit with P. interjectum; however, the spores are mostly, but not always, abortive. The elegant and popular Polypodium cultivar 'Cornubiense' now occupies a place of pride under the mantle of P. xmantoniae (Rickard 2000). 'Cornubiense' is a bipinnate to tripinnate attraction with broad pinnae that are deeply lacerated at the outer extremities. It has a tendency to revert as well as to send up indecisive fronds that are midway between the two. Readily available by division, it is one of only a few cultivars in commerce in the United States. Wintergreen and briefly summer deciduous, it serves well as a focal point in the winter garden in Zones 6 to 9. "Polypodium okiense" (from the Oki region) is a Japanese species that is in cultivation in the gardens of German collectors. It has not been officially described but has lanceolate warm green fronds to 18 in. (45 cm) with opposite round-tipped pinnae on proportionately long stipes. Polypodium sibericum (from Siberia) is a small, 4- to 8-in. (10- to 20-cm) circumboreal species that was once classified as P. virginianum and is now believed to be one of its parents along with P. appalachianum. It is native to northern latitude extremes and qualifies as a Zone 2 to 5 candidate where it appreciates a long, dark winter and welcomes a cloak of snow. Polypodium Xmantoniae 'Cornubiense' as found in the U.S. trade with bipinnatifid fronds that will indeed produce pinnatifid reversions. "Polypodium okiense" in the Jessen alpine garden. Polypodium vaccinifolium (foliage like Vaccinium) is included as a fun distraction for its usefulness in twining around trees in semitropical gardens or in warm and humid household and/or conservatory conditions. Small, 1/2-in. (13-mm) pinnae look much like the leaves of creeping figs and have the same visual impact. The plants need humidity, soft light, and a handy tree for climbing helps. This species has recently been reclassified by many botanists as Microgramma vaccinifolia.